Check how far you are from your local schools with our distance calculator. And check their latest exam results and demographic information. And see how catchment areas have changed over time. And find out how far your house or another property is from nearby schools. And see how many places have been taken by siblings and how it’s changing over time. Such a helpful tool in the mire of researching potential schools. The school distance calculator feature is a useful extra, particularly in areas like ours where catchment is such a significant factor. 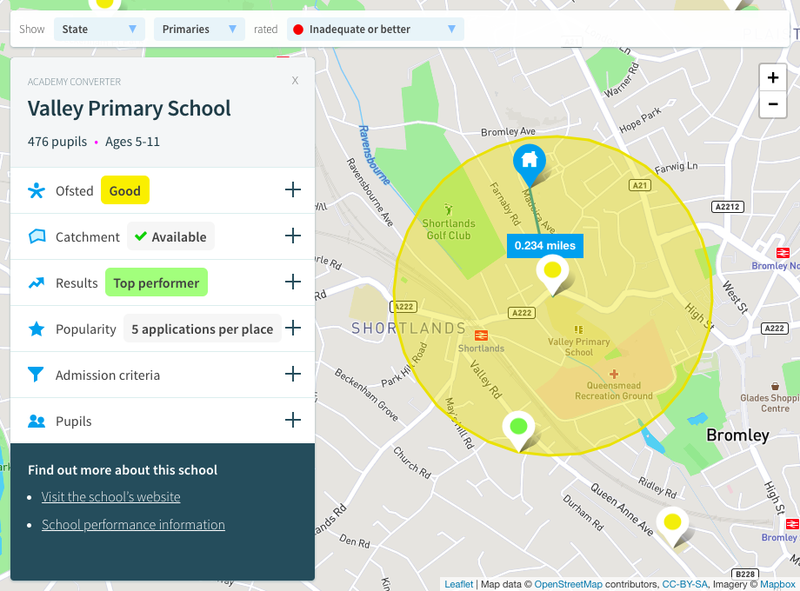 This site aims to help parents and house buyers understand how likely their children are to get into a particular school by visualising data on catchment areas and competition for places. It also provides information on schools’ Ofsted ratings, exam performance and demographics. What is a catchment area anyway? Good question — it’s probably not what you think it is. There is no such thing as an area around a school where, if you live there, you’re guaranteed a place. Every year, the geographical area from which a school admits its pupils is different. Some schools have what local education authorities call “priority admission areas”. If you live in one of those, then your application is prioritised over people who live outside it, but you’re still not guaranteed a place—all the places could all be taken by people who also live in this area but live closer to the school. So you see, it’s complicated. This site aims to record, as far as is practical, the effective catchment area for every school for every year of admission. There’s more information on how catchments work on our about page. The basic school data is taken from a mixture of different Department for Education sources like Edubase and the school performance tables. Data on school catchments is collected from individual local education authorities. School location data (which is weirdly inaccurate in the DfE data) has been made more accurate thanks to OpenStreetMap contributors. While every effort has been taken to ensure the data is as accurate as possible, fallible humans have been involved at every stage of data processing, so inaccuracies will be present. Please double-check data with schools and education authorities before making a decision based on it. If you spot any inaccuracies in the data, let us know.